We were standing on a cliff in Cicurug and stared at the calm dark green water below, speckled with white foam when the waterfall kissed its surface. It wasn’t the highest or most majestic waterfall I have ever seen, but it was the first one with a pond wide enough to swim around in. Most importantly, it was the first waterfall I didn’t have to share with anyone other than my travelling mates. For a short hour that morning, it was ours and only ours. Pak Iyas, our barefooted guide, had spent the last hour swinging a machete left and right to open up a footpath for us. He pointed to a nearby ledge and urged us to jump into the pool below. I looked down. We were quite high up against the watery enigma below, which was clear enough on the edges for us to see the white cliff rocks but turned into a black-green hue in the center. I couldn’t tell how deep the pond was. Dan, a volunteer in Portibi Farm that hiked to the waterfall with us, took no time to shoot himself into the pool like a cannonball. He made a big splash and emerged within seconds, grinning from ear to ear from the adrenaline rush. The water was cold, he said, before climbing up and jumping in once more. Twosocks had started to climb down the cliff when Dan jumped in and he immediately dived into the water once his foot reached the edge of the swimming hole. A yelp escaped his lips when he emerged for air. It was icy cold, he said. But still he dived, swimming all the way to the waterfall and back. I, on the other hand, cautiously slithered down the slippery cliff. My hands grabbed the rocks for support as my feet felt its way around, trying to find a safe spot to rest and support my legs that have gone a tad wobbly from the one hour hike. Slowly, painstakingly slowly, I made my way down. When I finally arrived at the swimming hole’s lips, Dan the human cannonball had splashed himself three times into the pool. My toes told me that the water was indeed icy cold. My knees agreed a few minutes later and my stomach begged me to delay its turn to be enveloped in the coldness. So little by little I dipped into the pool, going a bit deeper once a body part has accepted the embrace of cold water, so I can handle the protest of the next piece of skin as the calm water pierced and prickled it. It might have been a painfully slow descend, but it also helped my senses wake up to the sensation of being in a forest water. The pronounced smell of green, that pleasant concoction of wet earth, trees, and its lush leaves. The soft mossy stones underneath my toes, so different from the grainy sand and sharp pores of sea rocks. The gentle, steady trickles of the waterfall, a higher pitch from the deep throaty sigh of waves I am used to. 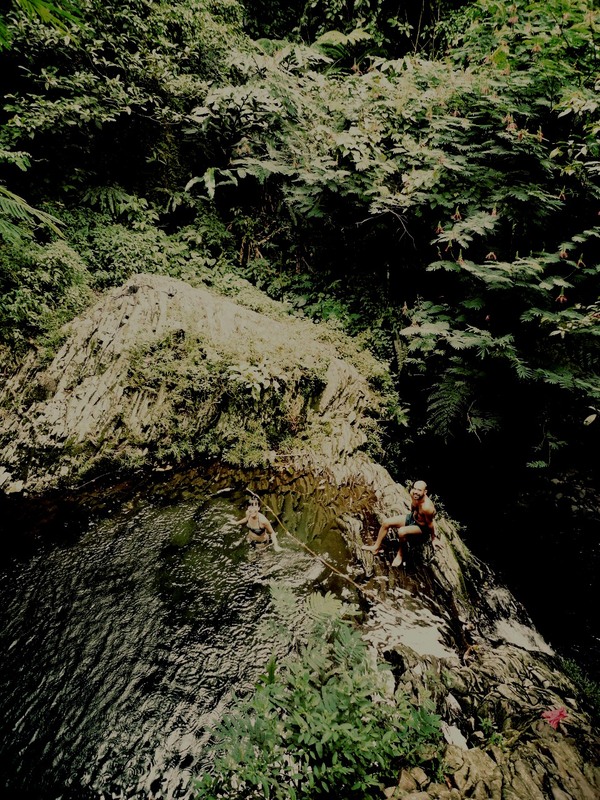 The sea and the forest swimming hole are both wild waters, but they are as different as the sun and the moon. When my chest has calmed down in the cold water, I surrendered my whole body and swam. 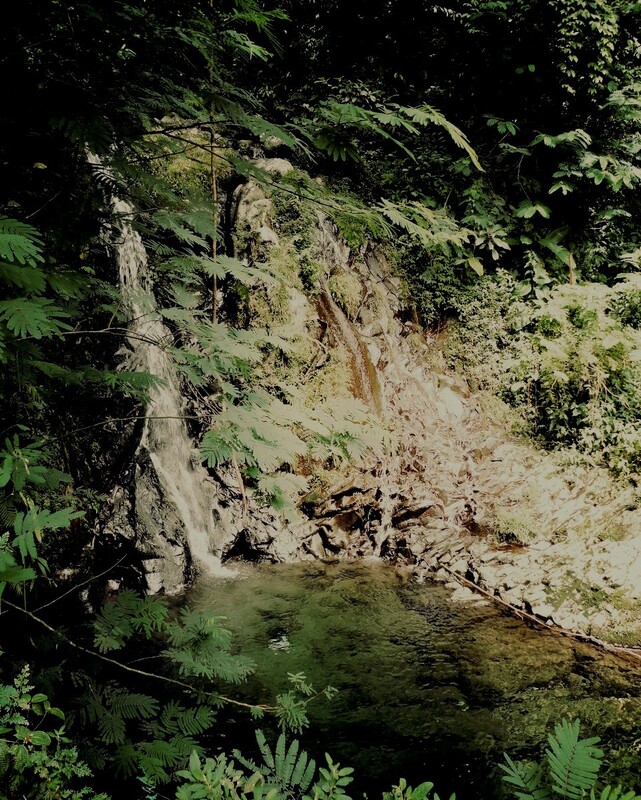 To the waterfall, where I paused to let the stream massaged my shoulders. To the middle of the swimming hole, where I floated and stared at the fifty shades of green in the canopy above. To the edge, where I cheered for Twosocks when he took his turn to jump from the ledge. I didn’t jump, but I didn’t mind. I was comfortable with my slow acquaintance with the water and enjoyed my own pace. Swimming back and forth, getting to know the black-green water, indulging in the fresh cold forest water scent. Whether it is forest water, the salty sea, or even the chlorinated pool, a water baby is always content in her element. In the end, I stayed in the water the longest.